You might recognize this beautiful home because it was once featured during Christmas last year. 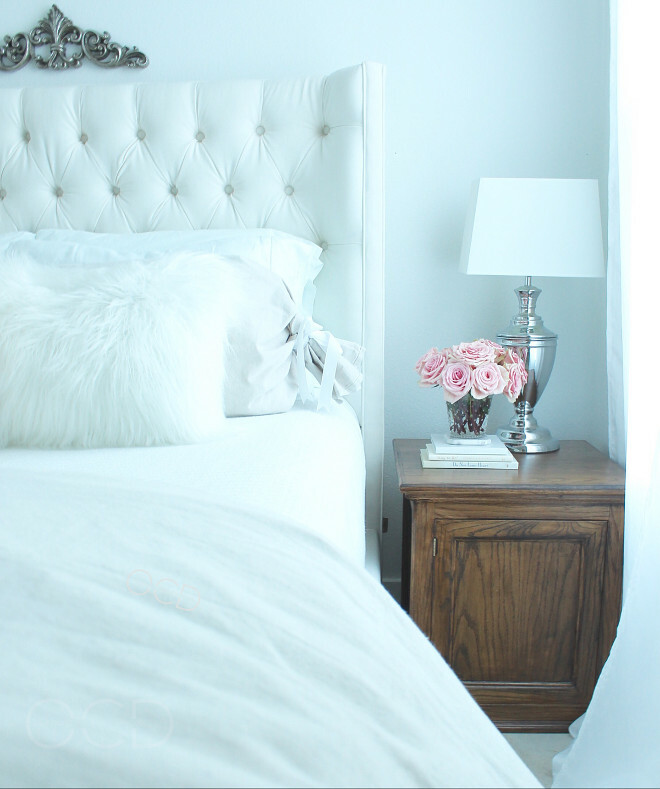 Having Charli, from @organizecleandecorate, once again on Home Bunch is a treat! Her welcoming personality and her high energy makes you feel as if you’ve known her for years. I adore her and her stunning home that’s why I invited her to be back here today to show her latest projects and some extra rooms! I hope you enjoy the post! My husband and I celebrated our 15th wedding anniversary in December. In those 15 years we have lived in 15 homes. No, we are not in the military. Just crazy, evidently! In 2016 we finished building our dream home. Is it perfect and exactly what we dreamed? No. But it works far better for us than any of the previous 14 homes we’ve lived in, and we can make all the changes we need to, because its OURS. Building a home on some land was a long time dream of ours. I can remember a few month after we were married, talking about the area that we live in now and how amazing it would be to live here in a beautiful home with acreage. It seemed like a far away dream, and one that we wouldn’t accomplish until we were middle aged (we are both now in our 30s). Two years ago, when we closed on the land our home now sits on, was the beginning of the fruition of our dreams. The concept of “home” is something very important to both us. Having a huge house with all the modern conveniences you can buy wasn’t so important to us as was having a home that allowed us to live out our lives the way we want to live. 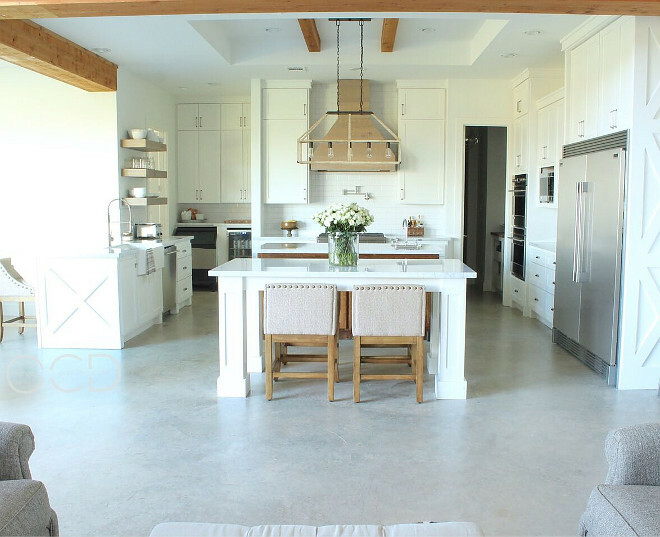 We wanted to create a home that would be a respite from the stress of running multiple businesses. Our home needed to be a safe place for us. A refuge from the world. A safe place for the three of us (we have a 13 year old daughter) and a place friends and family would want to come visit. Our home works for us. 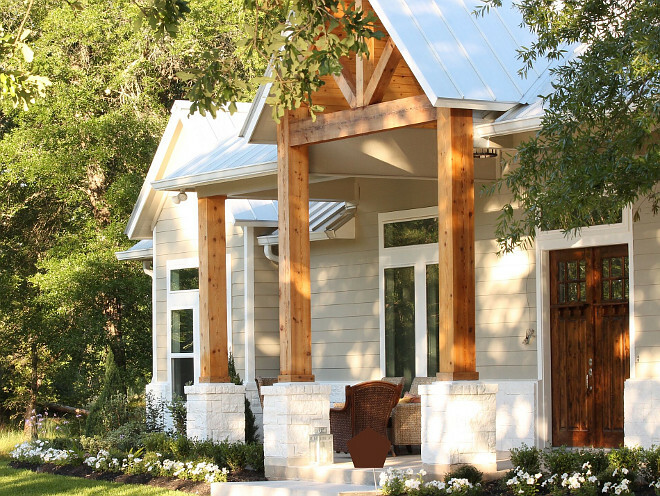 From the acres of trails we’ve made for hiking and off roading, to the centrally located school room, we designed our home to accommodate the way we have designed our lives. 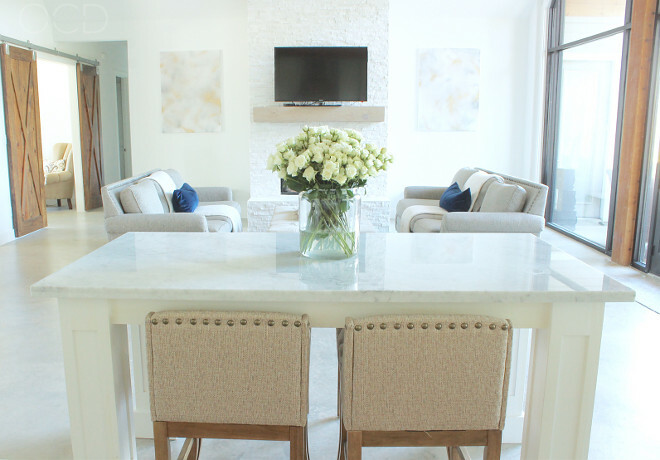 With our unique lifestyle, it was a blessing to be able to design a home around us. 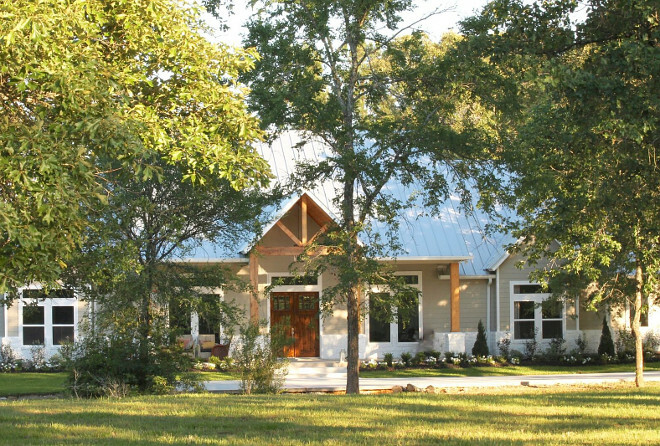 Nestled into the Piney Woods of east Texas and sitting on 13 acres, our home is a mixture of rustic chic, industrial, and modern farmhouse. The metal roof was left unpainted and we simply sealed all of the cedar that you see- I’ll never forget the incredible smell as the cedar was being cut and installed! Heavenly! The stone is a mixture of different stones, which we had white washed. The hardy plank is painted Sherwin Williams Requisite Gray and the white trim is Sherwin Williams Extra White. 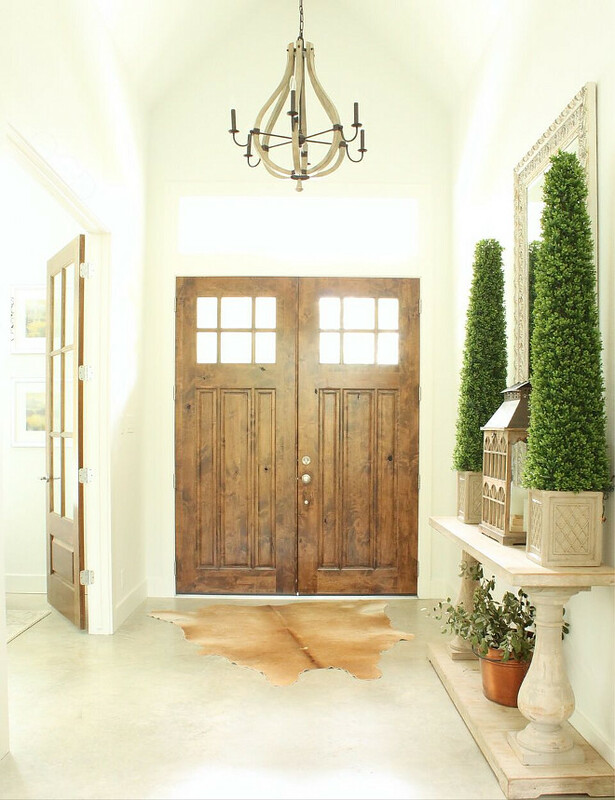 Double front doors open to a neutral foyer with vaulted ceiling. Wall paint color throughout the home is Sherwin Williams Extra White. The floor are sealed concrete. The cow hide rug was purchase from Sam’s Club several years ago. The front doors are stained with Minwax’s Provencial. The console table is from Gallery Furniture and has since sold out, but Restoration Hardware has one that is nearly identical. 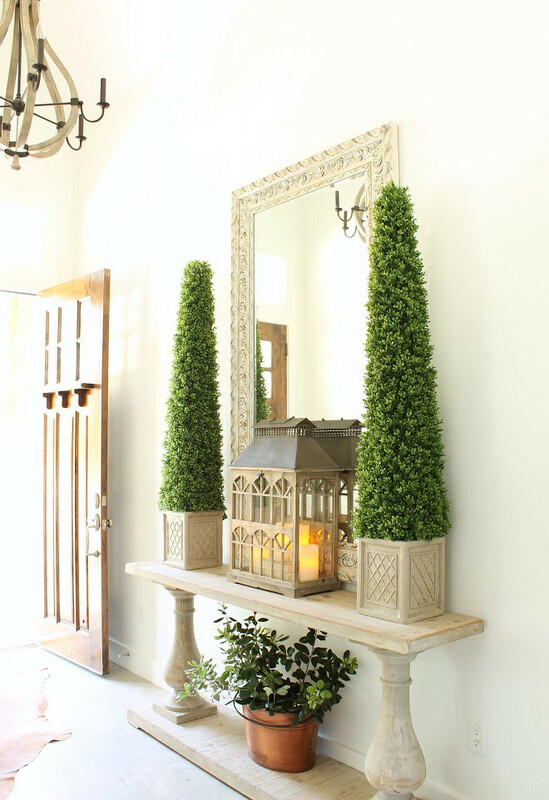 The mirror, topiaries, basket, and oversized lantern are all from At Home. the music room so that we can still work and talk while she practices without distracting her. The chandelier is the black wrought iron orb chandelier available through Overstock. The chair and a halves are also sleepers and are from World Market. With a large extended family this provides extra beds for visitors. 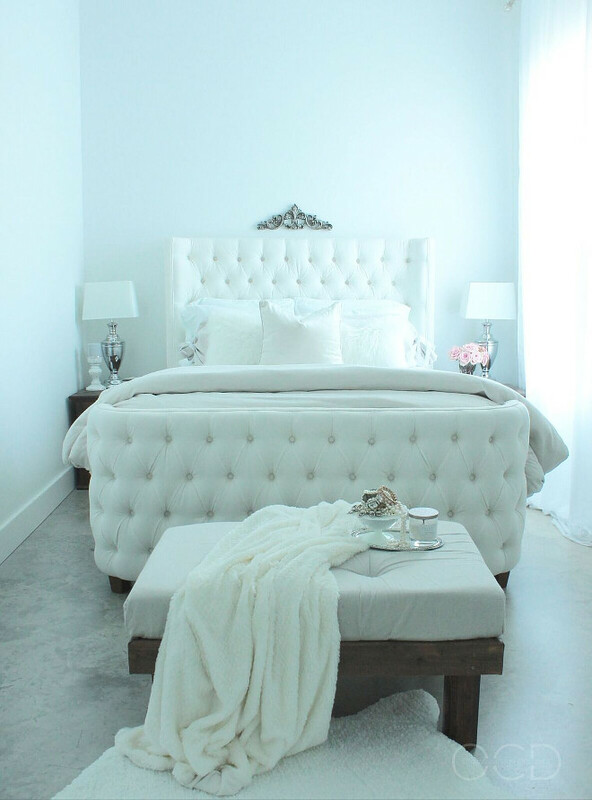 The ottoman is from At Home, as are the side table, lamp, apothecary jars turned vases, and poster frames. They are the Champagne Dotty poster frames in 24×36. 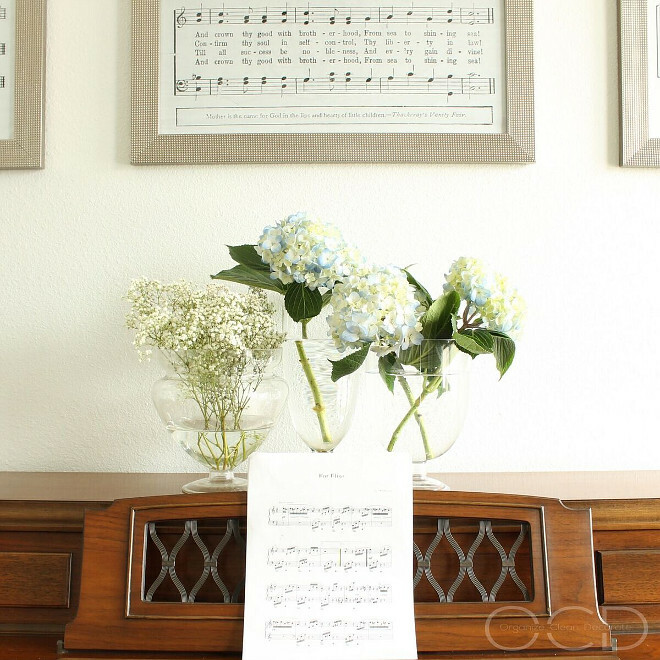 I filled the frames with prints of some of my favorite hymns I found free online and had printed. 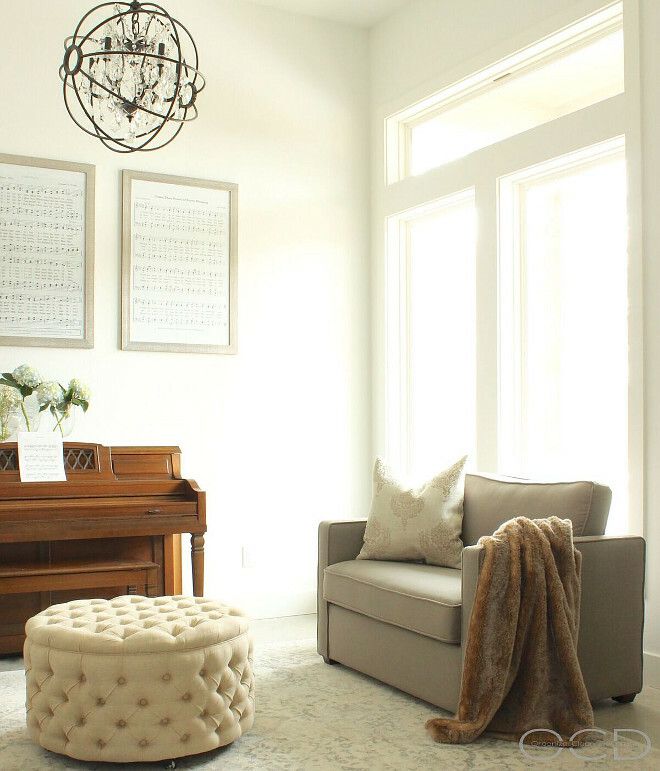 The rug is from Rugs USA – Bosphorus Floral Ornament Rug. The piano is made by Everett. 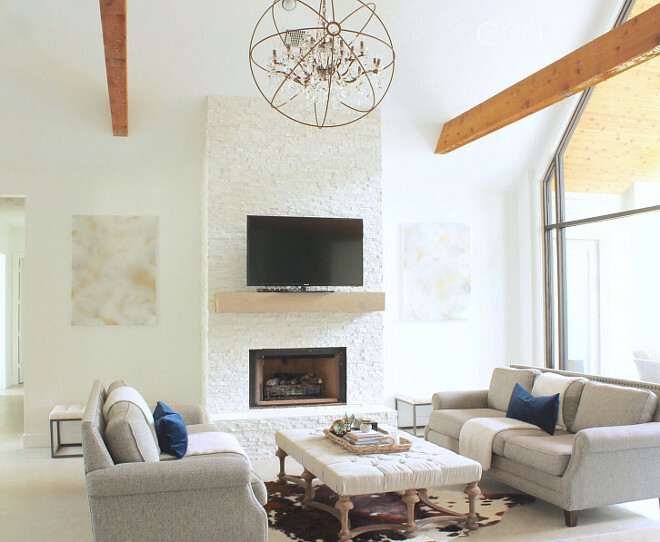 Our living room features a cathedral ceiling, cedar wrapped beams, and a floor-to-ceiling quartzite fireplace. I chose to go with two long sofas flanking the fireplace to open up the space, aid in the flow between the kitchen and living room, and to give an unobstructed view of the focal point of the room- the fireplace. Fireplace mantle is custom made from White Oak with a Classic Grey stain to give it a weathered look. The fireplace is clad in Glacier Splitface Quartzite. 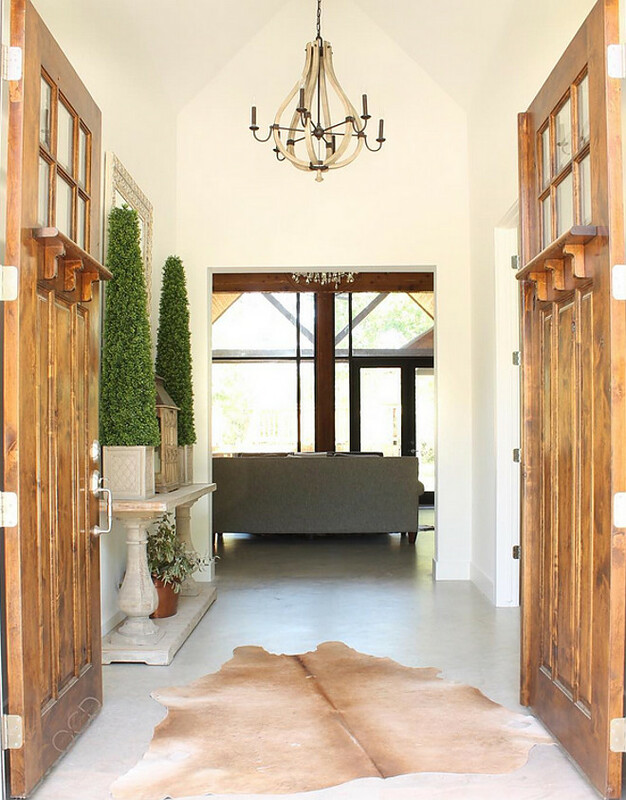 The cowhide rug was purchase from RND Rustics. The tufted benches on either side of the fireplace are from Target. The art above them was made by the homeowner. The ottoman was purchased from Laurie’s Home Furnishings. 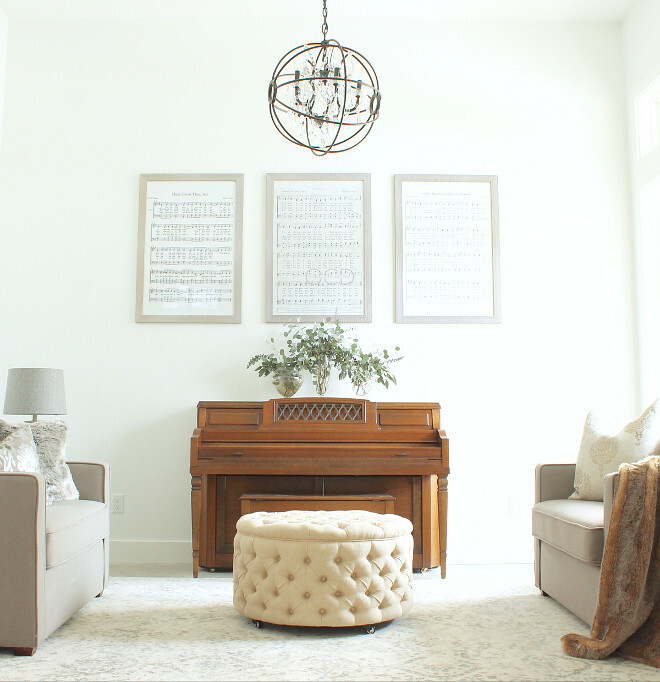 The orb chandelier was, surprisingly, a must have- of my husband’s! It is the Foucault’s Orb Crystal chandelier from Restoration Hardware. Sofas are the Piedmont Gray sofas from Rooms To Go. The throw blankets are Threshold from Target. 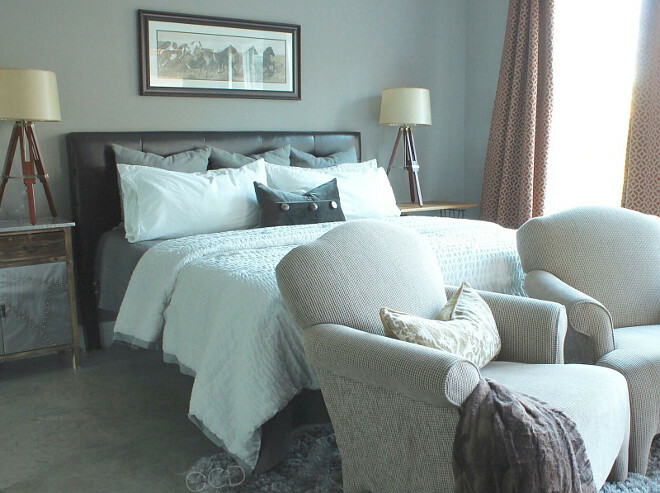 The navy velvet lumbar pillows are custom made by the homeowner. 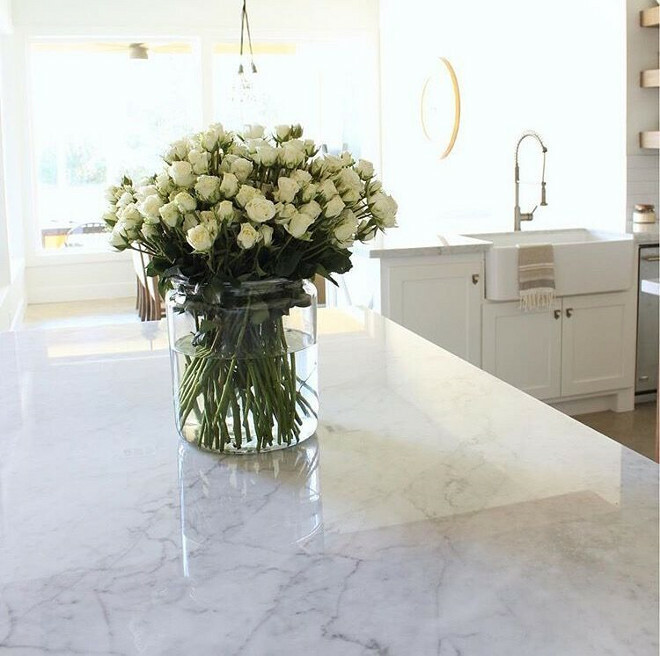 We absolutely love having two large islands! We do the majority of our meal prep on the inner island and we eat the majority of our meals around the outer island that my husband designed to mimic the look of a table. It also works out really well for parties. 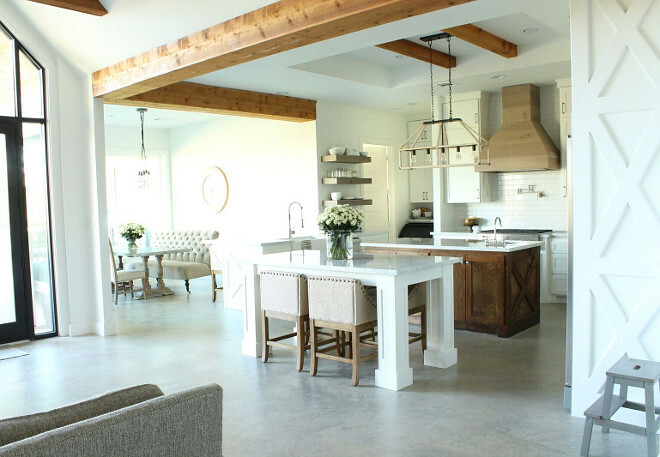 The flow of the kitchen is very conducive to both day to day usage as well as entertaining. The commercial ice maker (far left by the floating shelves) comes in great for parties, holidays, girls night in, and family gatherings. It is a Scotsman under counter ice maker. The beverage refrigerator is from Tramontina. 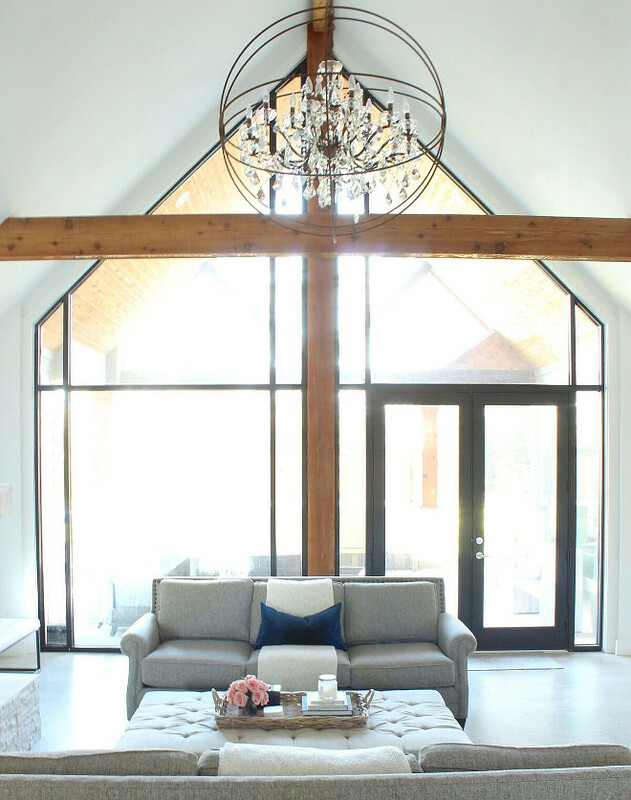 The rustic lighting is “Fredrick Ramond FR41205IRR Emilie 5 Light 42 inch Iron Rust Linear Chandelier Ceiling Light”. 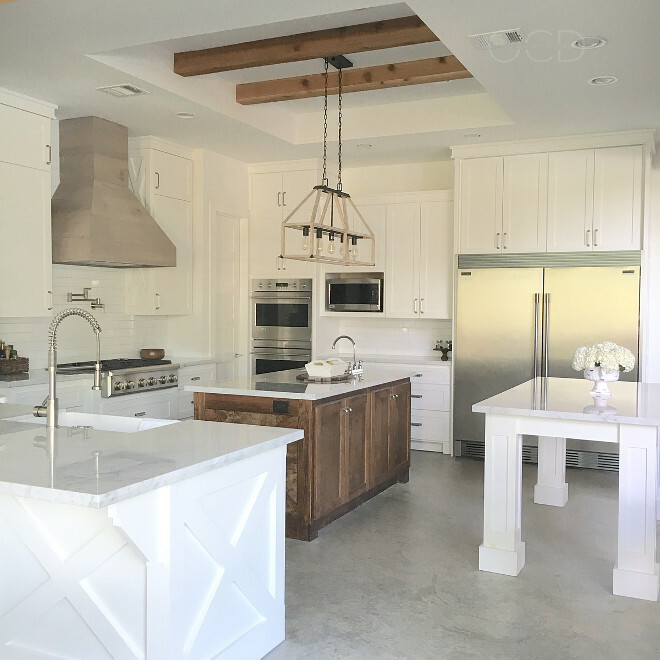 The kitchen hood is White Oak with a Classic Grey stain. Backsplash is Bright White Ice Subway Ceramic Tile. Pot filler is by Danze Parma. Sink is the Blanco 30 inch apron front single bowl kitchen sink. Faucet is by Danze Parma. 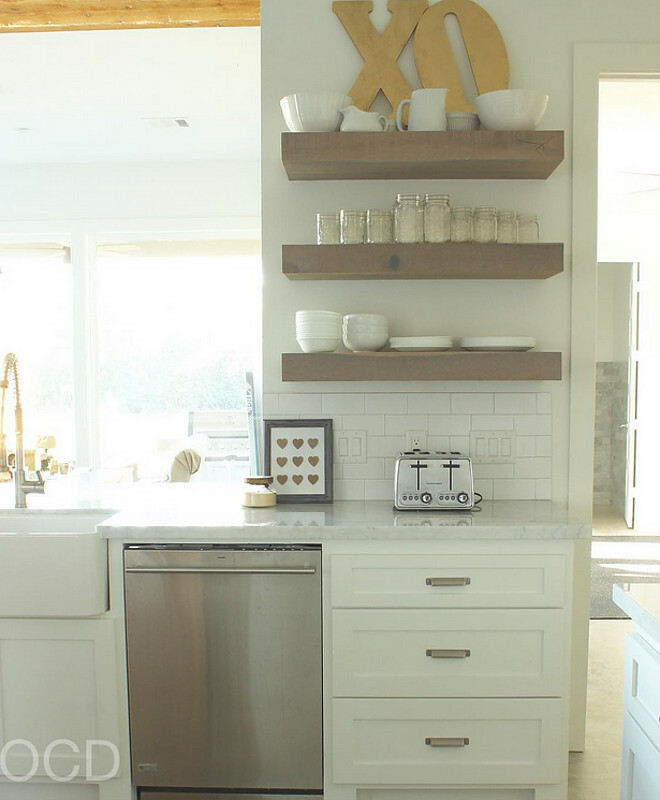 The floating shelves are custom made from White Oak with a Classic Grey stain to match the mantle and hood. Cabinet hardware is made by Amerock Hardware. Cabinets are custom made and painted Sherwin Williams Extra White. Wood island is made from pine and stained Minwax’s Provencial. Double ovens, microwave, dishwasher, and range top are all GE Monogram. Refrigerator and freezer and Frigidaire Professional. 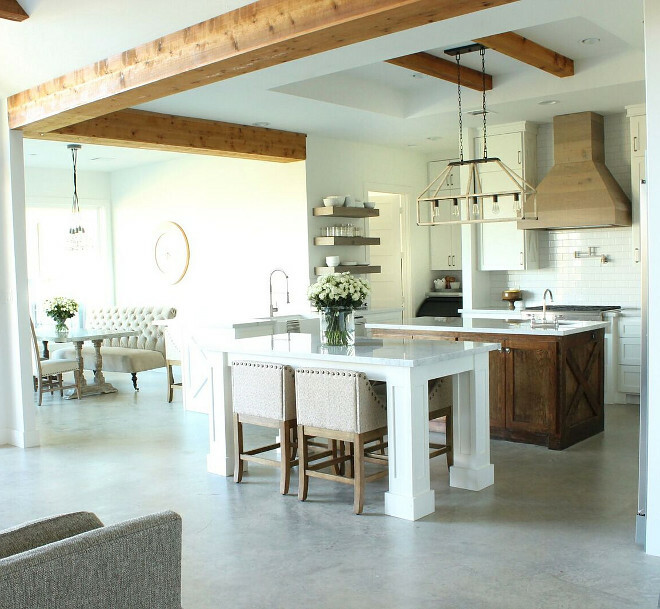 The barn doors are custom made from pine and stained with Minwax’s Provencial. Veggie sink and faucet are from Home Depot. Just off the kitchen, on the other side of the kitchen peninsula is the breakfast nook. We wanted large, but affordable windows and these were the largest our window company could get us in the space of a couple weeks. I’m sure you’ve noticed by now that we really love bringing in as much natural light as possible through as many windows as possible! The table was purchased at Laurie’s Home Furnishings about three years ago, but I don’t believe it is available any more. 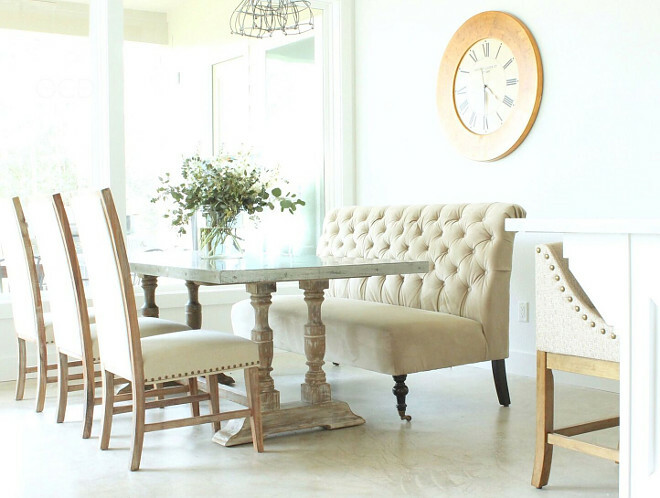 The settee and chairs are from World Market. The clock was purchased 9 years ago from Kirklands. 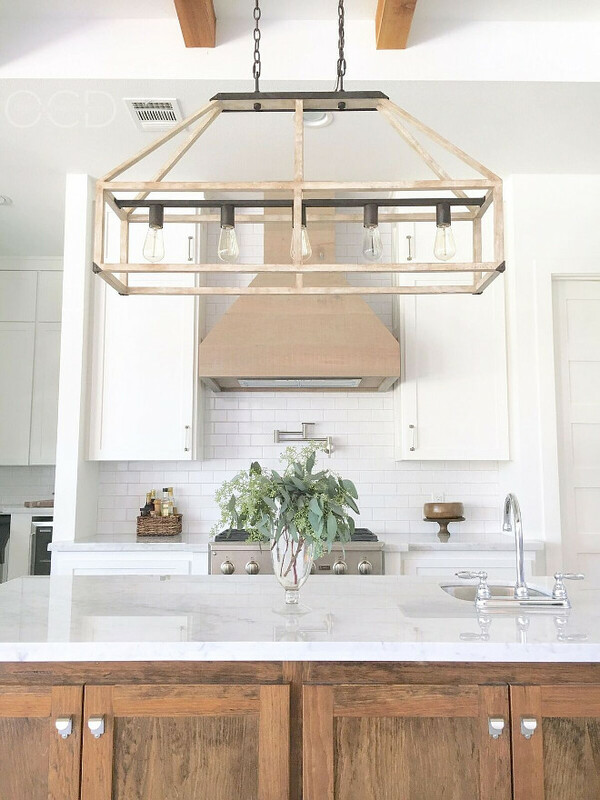 The light fixture is the Kichler Industrial Cage pendant. 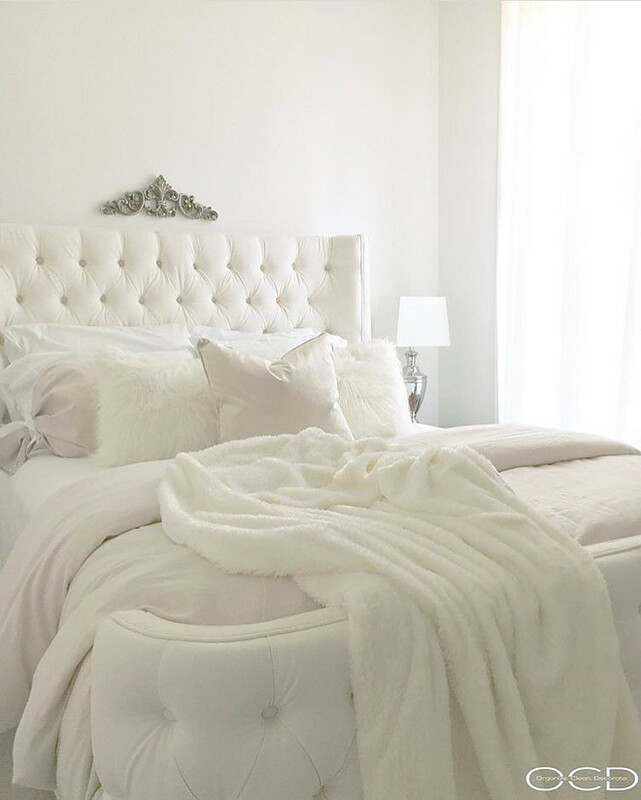 Another unique feature of our home, and one of the reasons we were so eager to custom build our own home, is that we have two master bedrooms that connect via the master bathroom. One side table is an antique sewing table base and the other is from At Home. 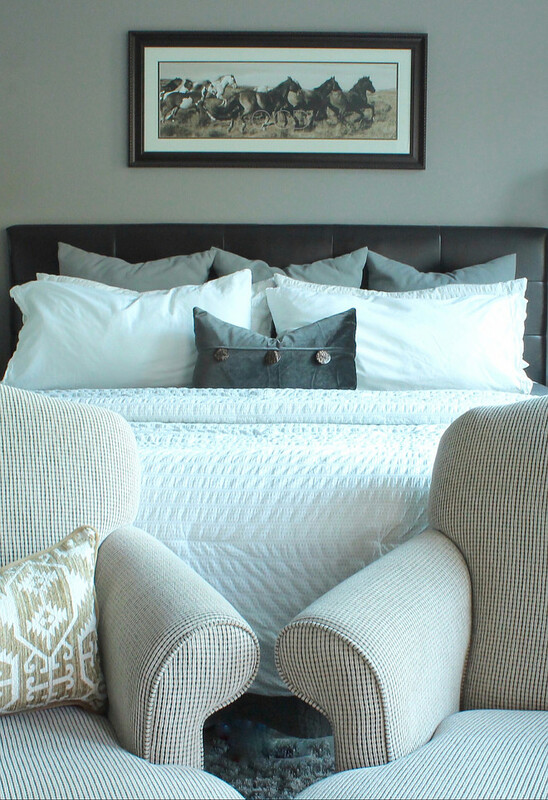 Headboard, Gray Pillows, Rug and Equestrian Art are all from At Home. Drapes are from JcPenney but have been discontinued. Gray velvet pillow is from Homegoods. Bedding and lamps are from Target. Paint color is SW 7018 Sherwin Williams Dovetail. Lumbar pillow and fur throw are from TJMaxx. Chairs purchase of off Ebay years ago. Since I have my own bedroom, I didn’t hold back. I went as feminine as I wanted with it. Bedside tables were custom made. As was the ottoman. Scroll above bed, Lamps, Candlestick, Mirror : At Home. Mirrored box, Velvet pillow, Fur throw pillows: TJMaxx. Throw, Sheets and pillow cases: Target. Drapes, Duvet and body/bluster pillow cover: custom made by this gal. Bed is from Joss and Main but not longer available. Paint color is SW 7006 Sherwin Williams Extra White. 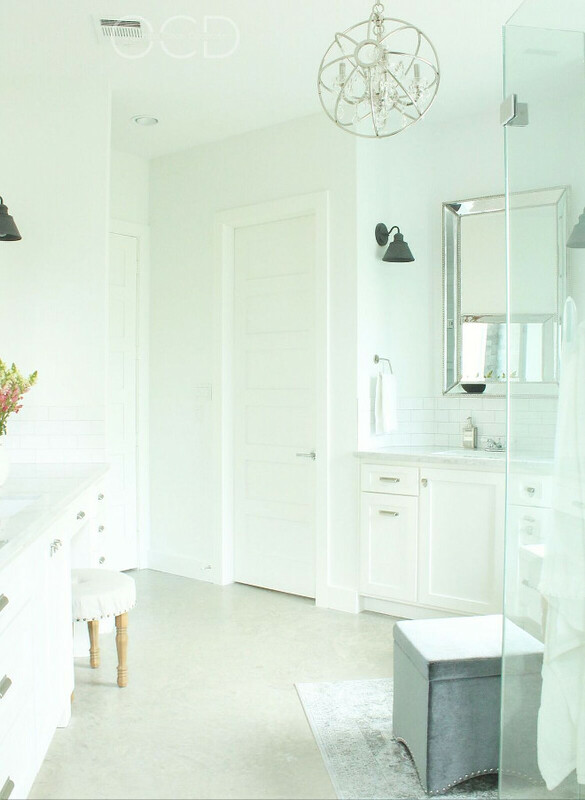 Charli’s farmhouse-inspired bathroom feels peaceful and relaxing. 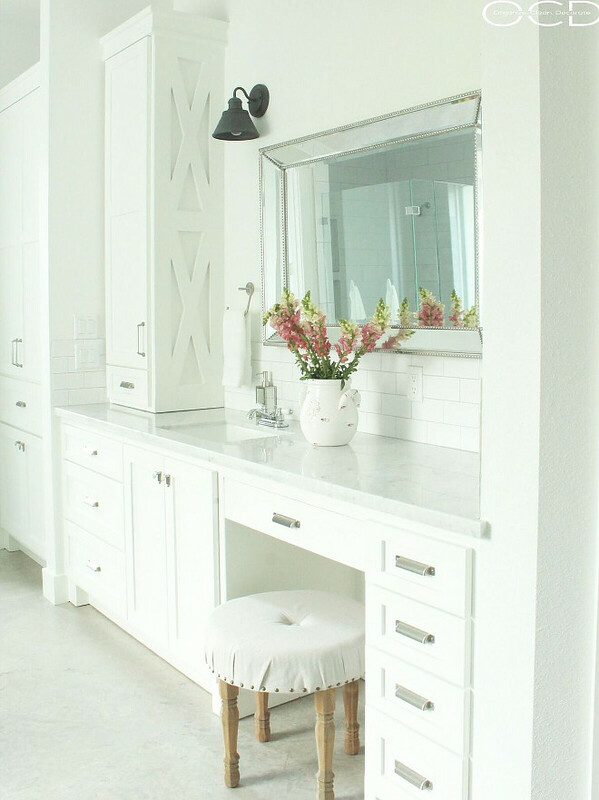 The vanity stool was made by the homeowner. Sinks are from Home Depot. 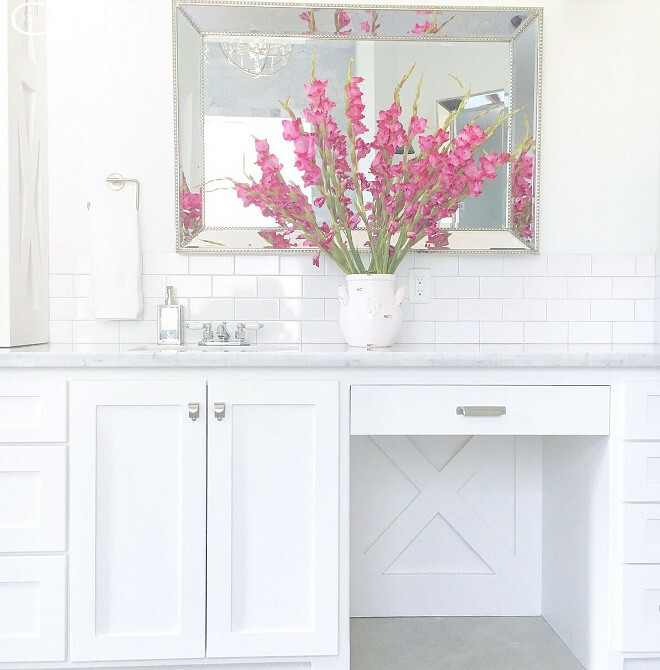 Crisp White: Sherwin Williams Extra White. Backsplash is Bright White Ice Subway Ceramic Tile. Chandelier is from Wearhouse of Tiffany. Barn Sconces are from Home Depot. Hand towel holders from Home Depot. After a long day we both enjoy a hot shower before bed so we wanted our master bathroom to feel luxurious. I don’t always take a bath, but when I do, I prefer to be covered in steamy hot water up to my chin (did you read that in the voice of The Most Interesting Man in the World like I did?! ) so a large bathtub was a must have. 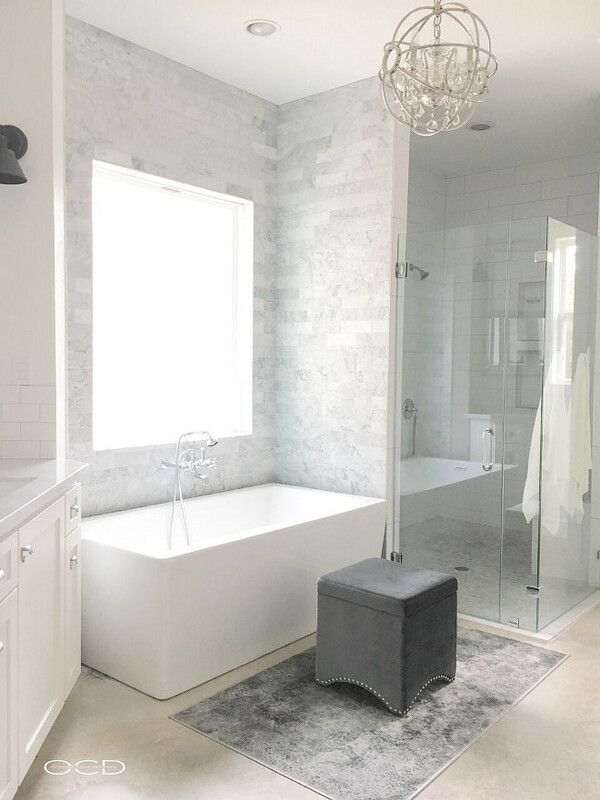 I love the clean modern look of a free standing tub, and this one fit the bill. To keep the bathroom from feeling too modern, I chose classic, vintage looking faucets and a tub filler. Bathtub nook is tiled in Bianco Carrara Marble. Shower Tile: Bright White Ice Subway Ceramic Tile in 6″x18″. Shower floor is tiled in Bianco Carrera marble penny tile. Faucets, tub filler, and shower heads from Home Depot. Originally, the closet was supposed to be my bedroom. But when we were going through the house with the electricians, it occurred to me that the bedroom was awfully big, and while the closet was too, I’d rather have a bigger closet. So I went back to the house we were renting while we built, and measured the width of my bed and side tables. Wouldn’t you know, with maybe two inches to spare, they would fit. So we swapped the closet and my bedroom out. This allowed me to have my dream closet, complete with a four and a half foot tall island. The organizer in me has had a field day organizing the island. And my husband has all the shoe storage his heart desires. A win-win! Bench is from At Home. Everything is painted in Sherwin Williams Extra White. After we completed our house a year ago and moved in, I didn’t really purchase many new things. I moved things around constantly and (not so) patiently waited for us to settle in and get a feel for how we use the house. Now that I have a good understanding of what our needs are, I’ve slowly been undertaking projects and decorating the house. For me, this is fun! I love making plans for each room and slowly bringing those plans to fruition! I’m currently working on our schoolroom/office and then on to the guest room! Hopefully next year we can work on the outdoor spaces as well. We’ve had a pool and outdoor areas designed for us already and are eager to pull the trigger on them! I’m also looking forward to eventually building a cute little guest house and a shop! Wasn’t it wonderful to see Charli’s home? I love how unique the spaces are and how she decorates every room. 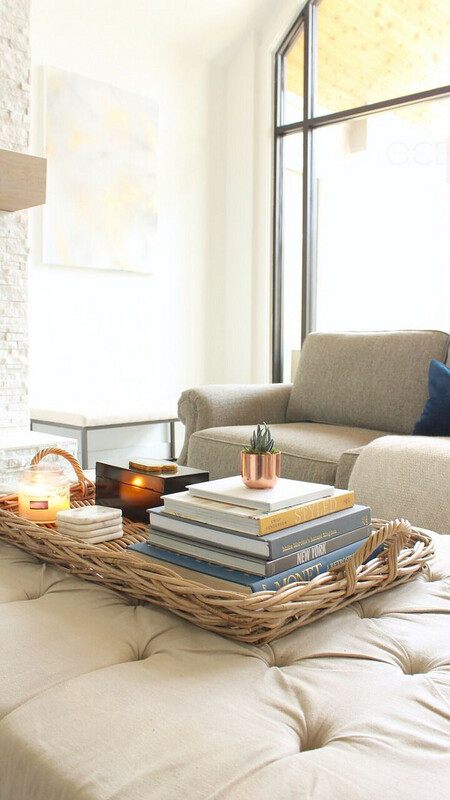 Her home feels light and peaceful… and that’s how I hope you feel after seeing this house tour. May you carry this feeling of peace with you to wherever you go today. Thank you for being here, my friends. Your presence is always a Gift.